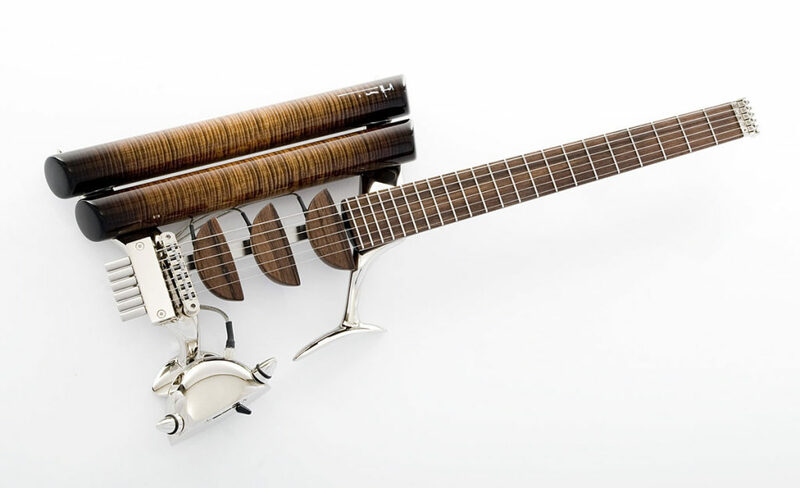 Teuffel Guitars are innovative and quirky. They are also true works of art! I don’t think there are many guitars that I look at that I can say are ugly. The way the wood has been worked and finished to create the instrument that we all know and love is a thing of beauty. However, I have to say that there are very few guitars that I would say are a work of art – Teuffel Guitars are one of the few! The thing that surprises me most is that there are not more amongst us who feel the same way. Ulrich Teuffel is a German, inventor, engineer and genius guitar luthier who has gained a reputation for challenging the concept of what a guitar should be. Teuffel started his professional life as a metal working apprentice with Mercedes Benz and it is clear that some of this experience defines his approach to designing a guitar. Teuffel started creating guitars back in the 1980s and many of these early instruments were inspired by the likes of Les Paul and Leo Fender. His desire was to create the perfect guitar and so gaining acceptance that his guitars were equivalent to, or better than, a Strat or Les Paul was essential for getting them into the shops. However, the creative innovator in Teuffel would not be silenced and he enrolled himself on an Industrial Design course. On that course he was introduced to the designer of the original Apple Macintosh computer Hartmut Esslinger a meeting that was to result in Teuffel’s radical Birdfish Guitar design. The Birdfish challenged the concept of what was possible in a guitar and what materials could be used. The guitar had a two piece aluminium body and it was fitted with sliding pickups that could be changed in a matter of seconds. You can see a Birdfish in action in the video below. For Teuffel tradition is something that is there to be challenged and all his guitars reflect that. Every year he builds up to 25 guitars in his one man design studio. Prices for his guitars range from $7,000 to $15,000 but if you want a true piece of artwork, that you can also play as a guitar, then Tueffel guitars are a must have. To find out more about Teuffel Guitars visit his website to see what he is currently working on. Prohaszka Guitars – Unique, Playable Works of Art!